Darryl Potter is the Collection Manager for both Molluscs and Crustaceans at Queensland Museum. Darryl is involved in collecting, identifying, labelling, and storing specimens from the animal groups of Molluscs (snails, bivalves, chitons, squid and octopuses) and Crustaceans (crabs, shrimps, lobsters, barnacles, etcetera). He also maintains the database that stores information about these collections. Darryl has accompanied other QM scientists, such as Peter Davie (Senior Curator of Crustacea), Jeff Johnson (Collection Manager of Ichthyology) and Dr John Healy (Curator of Molluscs) on many expeditions that involved inter-tidal trips and scuba diving in the beautiful waters off the Queensland and northern New South Wales coasts. Over recent months, Darryl and QM scientists have been busy compiling the revamped QM publication, Wild Guide to Moreton Bay and Adjacent Coasts, Vol 1 & 2. The book is authored by Peter Davie and several other QM scientists, and includes magnificent photography from QM photographers Gary Cranitch and Jeff Wright. To purchase the book, follow this link to Wild Guide to Moreton Bay and Adjacent Coasts. 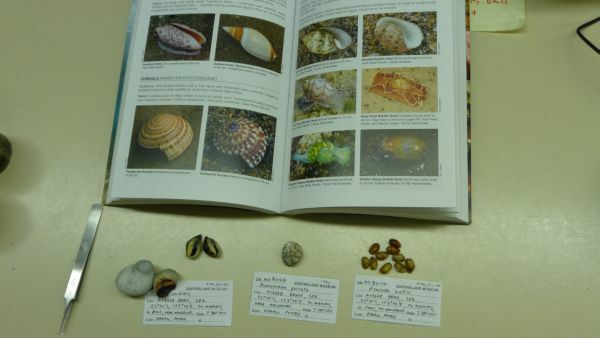 Darryl’s area of expertise includes land snails and marine gastropods (one-shelled molluscs such as snails and slugs). 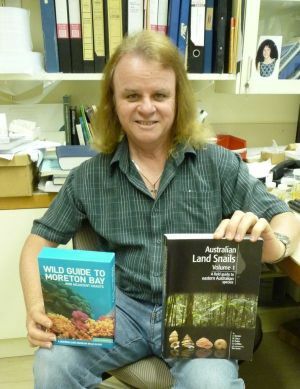 Darryl and three other colleagues have recently published the first volume of a guide to Australian land snails which is based on 20 years of fieldwork conducted across Queensland, coastal New South Wales, Cape York and the Torres Strait. The second volume is under production and will be based on snails found in the more arid and semi-arid zones of Australia. Already there are 800 species that have been documented for inclusion in this volume. Follow this link to purchase Australian Land Snails Volume 1: a field guide to eastern Australian species. Last week, Darryl was collecting specimens from Nudgee Beach and some of the specimens are shown below. He is now in the process of identifying, labelling and cataloguing these species. An interesting recent QM acquisition is the Diamondback Squid that appears in the image below. 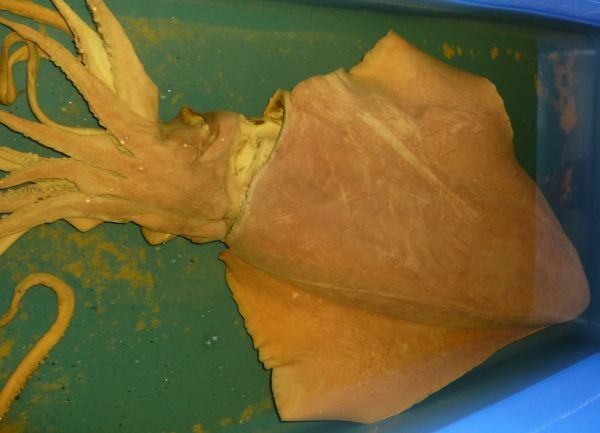 This squid is the largest cephalopod species to be collected from the waters off Moreton Bay. Its name comes from the characteristic diamond-shaped fin which extends along the length of the body. The arms have two rows of suckers and there are wide protective webs along their length. They can grow up to a metre in length and weigh as much as 30 kilograms. To find out more about magnificent molluscs and crustaceans, visit the Mollusc and Crustaceans section of our website. To read more about Darryl’s work, visit his Biography page.